I am using Numpy to read some txt files that could be any lines and then iterate them. I realize that I got “iteration over a 0-d array” when the file happens to contain only 1 line. Here is how I work around it — not very clever but it works. And yeah, I will try to fight with my laziness and populate this blog with bits from my research that could help others. With the help of Google, I benefit a lot from people I don’t know, and now I want to give. 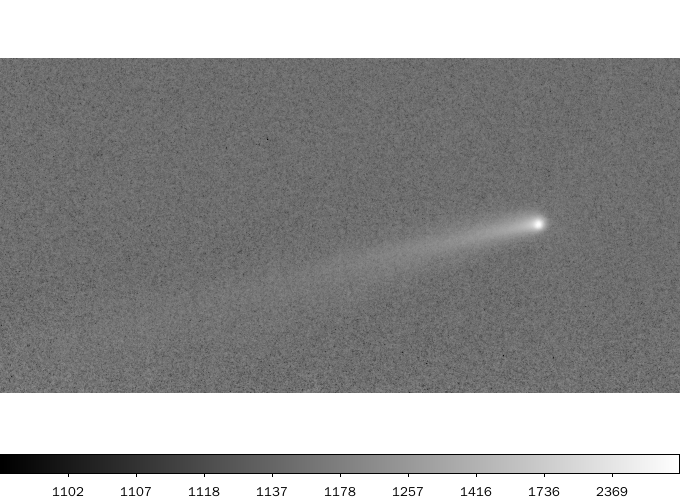 A Camelopardalid meteor and (one of) its prediction maker. Dr. Albert, the icon of the E.F. Fox Observatory, can be seen in background. Before going to E.F. Fox Observatory for monitoring the Camelopardalids outburst, I felt I would be very happy no matter my co-prediction is right or wrong. However, as always, sky (like life) is full of surprises and rewards and they often come in a way that is beyond our imagination. Sebastian and I left London at 5 pm EDT. It was overcast at first but soon cleared up. We arrived the E.F. Fox Observatory shortly before 9 pm. John Hlynialuk from the Bluewater Astronomical Society was already there. E.F. Fox Observatory is located in a dark sky preserve in Bruce Peninsula, I estimate the Bortle class to be 3 based on the experience this night. Two Polish observers arrived later and started preparing their multi-station video observations. There were several local amateur astronomers as well. We went to a nearby small town to grab something to eat and returned to the observatory at about 10:40 pm EDT or 0240Z. I saw two Camelopardalids within one minute as I walked from the parking lot to the observatory — each at 0–1 magnitude with characteristic slow speed and very noticeable train. This raised my hope for a great performance later in the night, as it was still 4 hours from the predicted peak. So I started standard visual observation at 1:37 am (0537Z). I did this more or less for fun, because I know CMOR and CAMO will be watching anyway. I need a new pair of glasses (I almost cannot tell that Mizar-Alcor is a visual binary!) so my LM isn’t high, only at about 5.5. I had 50 min. of efficient observation time in the first hour (0537Z-0634Z) and recorded 9 Camelopardalids. No fireballs, but they were all very slow and flew pass the sky very elegantly. From 2:34 am (0634Z) I decided to observe non-stop to nautical twilight (about 4 am). I saw 4 from 2:34 to 2:54 am, with a -1 magnitude bright one with yellowish train that brought us quite a bit of “wow”s (that was the best one of the night). The peak should be around 3 am, so I was anticipating something… but I was wrong. I saw two from 2:54 to 3:10 am, then in the next half an hour I saw none. A +3 Camelopardalid meteor emerged around 3:40 am concluded the whole night. Why the heck was happening? It seems the peak must be either a few hours early, or is too faint to be seen visually. Based on very preliminary data, I personally inclined to the former. Around 12:30 am I noticed a very strong radiant on CMOR’s real-time activity map (not the one on NASA, that one just got updated once a day), but the strength of the radiant does not seem to elevate much afterwards (implying the radiant has weaken since that map is an accumulative map). The all-sky camera system run by our group (which can only detected meteors up to +0 or so) also picked up as much as four bright Camelopardalids from 0250-0450Z (before 1 am) ranging from -3 to -1 magnitude (absolute), but only one afterwards. So here is the funny part: personally I was inclining to other researchers’ prediction in terms of peak time, i.e. 0710-0740 UT. However, at least for now, it seems Paul and I’s prediction seems to be closer to what we got. Mother Nature is good at teasing people, isn’t it? Meanwhile, the very preliminary IMO visual analysis (the visual peak seems to occur at about 0630Z with ZHR~15 as retrieved on May 24 at 6 pm EDT) and RMOB real-time analysis (the peak at 0630Z with ZHR~35 as retrieved on May 24 at 6 pm EDT) also shows an early peak but not as much as my impression with my visual observation and the results from CAMO. Hmm, it may not a great event in the sense of a meteor storm, but I still find it very fascinating. It seems our predictions must have missed something. There has to be a reason and I want to find it out. site "E.S. Fox Observatory" "Canada"
Magnitudes and SPOs not recorded. Acknowledgement: we thank John Hlynialuk for hosting us at the observatory. 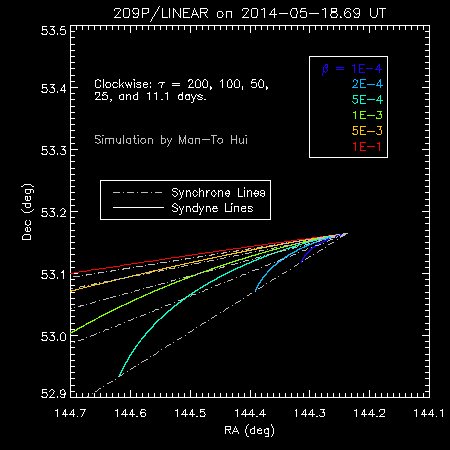 Carl Hergenrother (U Arizona) reported his broad-band photometry of P/LINEAR in CBET 3870. 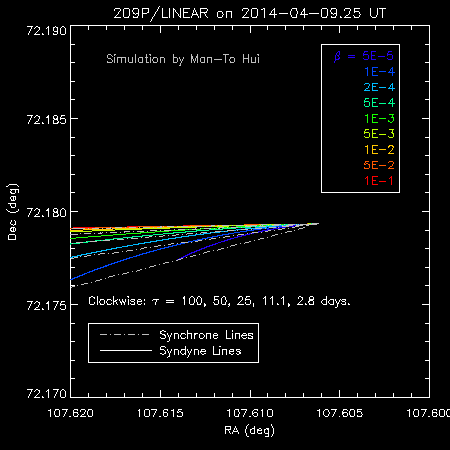 His analysis indicated a slow rotator (best fit ~21.86 hr) and a larger-than-expected nucleus (at least 2 km). He also suggested that the comet is only active within 1.4 AU from the Sun. There have been a few reports on meteorobs mailing list and noted by the American Meteor Society about some fireballs that looks like Camelopardalid member (northern radiant + slow). I remain skeptical until I see the orbit. Peter Jenniskens (SETI) is hosting a great website here and keeping collecting information about P/LINEAR and Camelopardalids. On the post of May 20 he noted the higher chance of seeing lunar meteoroid impacts as calculated by Peter Zimnikoval. The predicted peak time for the moon is about 4h UT on May 24. 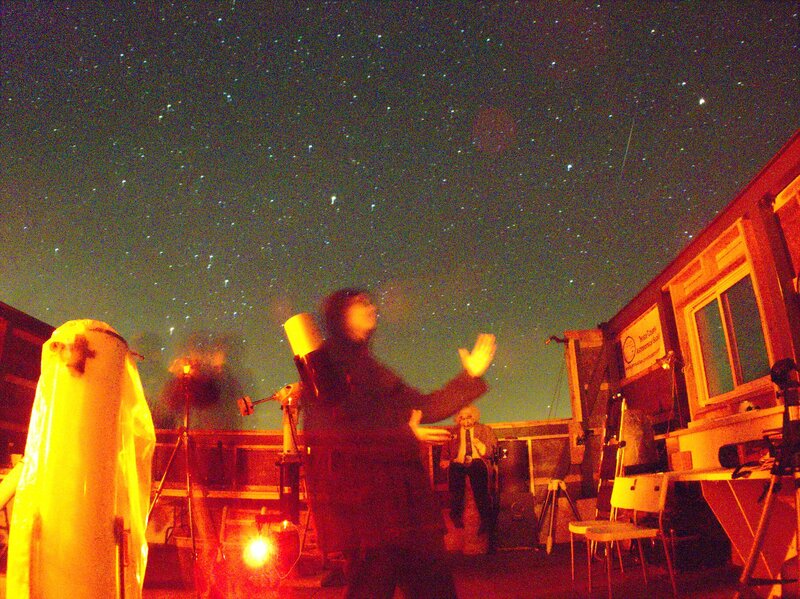 On the same date, Jenniskens also wrote that he and his colleagues detected an annual meteor shower called sigma Ursae Majorids in the CAMS network that appears in mid June. Note that this is actually reported in a submitted paper and he did not note the registered Camelopardalid meteor shower (code 451; this may or may not be the same Camelopardalid meteor shower we used to refer the forthcoming outburst) he mentioned in his earlier study (Rudawska & Jennsikens 2014). It is not clear to me why is this — for example, if these two meteor showers are in fact the same one. Jenniskens also reported the measurement by David Schleicher (Lowell) which showed an extremely low activity of P/LINEAR (CBET pending). For me, I have been trying to learn IRAF to reduce my spectra taken with Gemini in early April at the breaks of my thesis project. Well, I managed to do it at last (mind you, that was an EUREKA moment! ), but I am yet to refine it (combining more frames, etc). Initial measurement of cometary emission species of CN, C_2 and C_3 (upper limit is <~10**25 mol/s) agree with David’s suggestion and the conclusion of our earlier study that P/LINEAR seems to be very depleted in dust production. Meanwhile, I also check the daily log of CAMO and I do not see any activity pops up in either optical system or the radar. Today Apostolos Christou from Armagh Observatory visited our group and brought us a surprise — a fresh-new prediction by David Asher and Robert McNaught (I first learnt the two’s names when I was in grade 6 in primary school when preparing for the Leonids 1999 return). Their prediction kinds of aligned with me and Paul’s prediction, although their timing is more inclined to other predictions (peaks around 7h UT) and their predicted FWHM is shorter (~40 min). They also thought that materials older than 52-rev (~1800) is likely heavily perturbed and is difficult to predict. I talk to Apostolos and Paul about the idea of resonance enhancements (i.e. certain kinds of orbit setups that can reduce the effect of perturbation and preserve strong enhancements within the trail, see the strong and unexpected outburst in 1998 Leonids). They thought that perhaps nobody has taken a closer look into this (Paul said he didn’t), so we probably won’t know until we see it. Keep in mind that surprise can happen! The tiny comet 209P/LINEAR and its associated Camelopardalid meteor shower (which may produce an outburst on May 24, less than two weeks from now) are getting attentions, and it seems that people start talking about my earlier work with Prof. Paul Wiegert that made prediction of this new meteor shower — hmm, not bad for a first year PhD, I guess! However, I saw people quoting the number of ZHR=200 appeared somewhere in the paper (for example, Sky & Telescope and EarthSky), perhaps our wording in the paper was too cautious and I find the need to clarify. Indeed, we stated “a predicted ZHR of about 200 for our nominal scenario” (p. 3286 just under Fig. 3), but to my understanding of how Paul construct his model, this “nominal scenario” actually means that “209P/LINEAR is a kind-of nominal comet”, like those parent bodies of well-known and predicted meteor showers, such as 21P/Giacobini-Zinner (which is really what my Master’s thesis is about, by the way) or 55P/Tempel-Tuttle. Since our analyse seem to show that the dust/gas activity of 209P/LINEAR seems to be 1-2 magnitude lower than a “nominal comet” at its size, the “true” ZHR of the meteor shower may also be 1-2 magnitude lower, so I incline to expect a ZHR around 10-ish. Hmm, sounds not very encouraging. But I will be more than happy to find out if I am wrong. In fact, the uncertainty is so large that we literally won’t know what we will see until we see it. For example, as the event is caused by the material released by 209P/LINEAR about two century ago, the comet could well have been more active at that time — or it could be the remnant of a recent catastrophic event which would mean that a large amount of meteoroids have been deposit in the orbit. This is why we need meteor observation, it is like a time machine and can tell us some information about the parent body in its past. 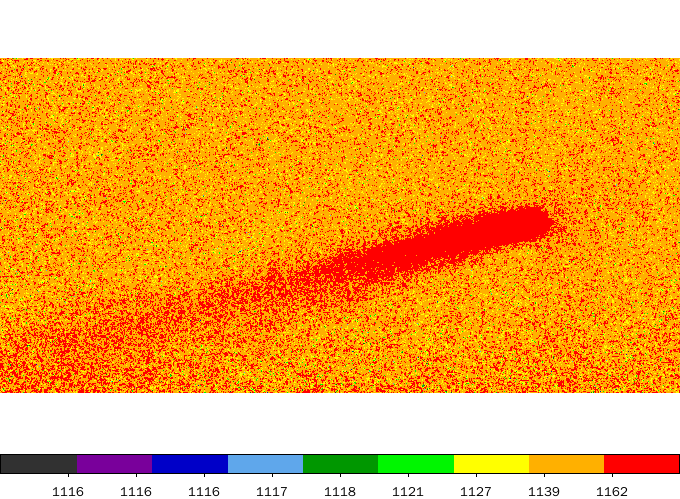 An interesting point I noticed is that at least two groups (Rudawska & Jenniskens 2013, Meteoroids, and Segon et al. 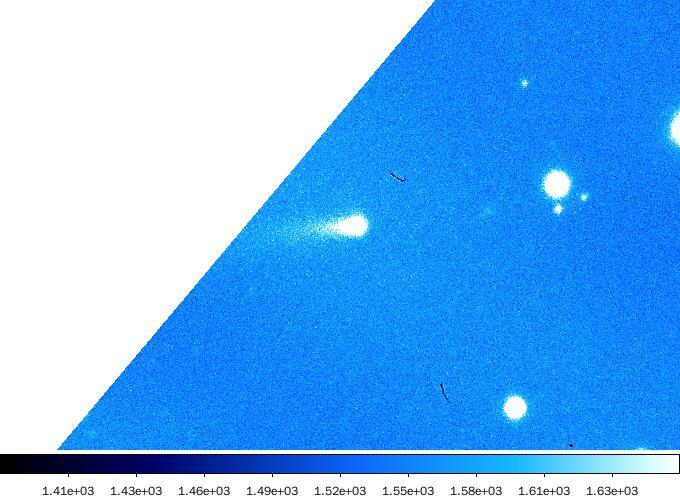 2014, JIMO 42) reported that they found a weak annual meteor shower in May while examining their own video data that may be linked to 209P/LINEAR. However, both groups reported a slightly earlier date (Rudawska & Jenniskens reported April 22 to May 6, Segon et al. reported April 24 to June 4 and peaked on May 12). If this linkage is real, then it implied that 209P/LINEAR was releasing more material possibly several centuries ago, as it takes time for the material to distribute around the orbit and shift from the parent body. From the perspective of dynamics, it is very difficult to chase the comet back to before ~1800s, as the comet makes frequent close approach to Jupiter that alters its orbit. In this tutorial we will go through the installation of Debian 7 (Wheezy) + Xfce 4.8 environment on a ThinkPad X60 1709APC laptop. ThinkPad X60 was released in January 2006 and it is among the last ThinkPad series that beared the “IBM ThinkPad” mark on its lower right corner. I have used the original Windows XP Home (which came with my ThinkPad X60), Ubuntu 12.04 LTS + Unity, 12.10 + Unity, Debian 6 + GNOME 2, Debian 7 + GNOME 3 (Default and Classic) and Xfce, and eventually decide to settle down at the (much) faster, newer and more stable Debian + Xfce. If you are interested in a comparison of each desktop environment, you may find here as a good start. The CPU of 1709APC (Intel Core Duo T2300) does not support x64 system so we must use the x86 version. The firmware of 1709APC also does not support physical memory over 3GB (even with PAE enabled). The creation of this document is inspired by “Debian Wheezy on Lenovo ThinkPad L420”. I got hints and helps from numerious websites and posts over years and I hope this document can be among one of them that are of some help to others. 2014 April 20: update the solution to Fn+F7. The installation of the Debian 7 + Xfce 4.8 system is simple. You can download the most recent i386 intallation image from here. For me, the ~630MB debian-7.x.x-i386-xfce-CD-1.iso is sufficient to use. You can burn it into your USB disk (make sure it is unmounted) with the following command. Note: make sure to change /dev/sdc to the actual address of your USB device! After this, you can directly boot from the USB disk and start the installation. Most of the Fn keys do not work naturally even with tpb package installed, but this can be fixed by tweaks. There is an excellent page on thinkwiki.org on how to get Fn keys to work, but it looks to be outdated for Debian 7 (thinkpad_acpi comes with the installation anyway) and I have no luck with it, although it does offer some hints on diagnosing the issues. The Fn+F2 does not work out of the box, but there is a fast and painless workaround with xflock4 command which is included in xscreensaver package. Navigate to Application Menu > Settings > Keyboard > Application Shortcuts, and associate xflock4 to Fn+F2 and we are done. I personally would not recommend modifying the ACPI as it seems more complicated than the shortcut method, there could well be a clever way to do this. I am amazed that Fn+F4/F12 does not work out of the box, it seems not many people have this issue. The keys were working without any additional work for my last intallation (Debian 7.0 beta + GNOME 3.6). The reason is in fact simple but not obvious to me at the first place: in xfce4-power-manager you can control the behavior after sleep/suspend and hibernation keys have been pressed, and by default they are set to “do nothing”! If you have tried this trick without luck and you think your issue may be hardware-related, you can try acpi_listen and xev to see whether your keys are really responsive, if nothing shows on your screen when you press the keys with these commands, then you may have a bigger trouble! Otherwise you can check if pm-utils is properly installed by, for example, manually executing sudo pm-suspend to see if the laptop can enter suspend mode properly. After getting Fn+F4/F12 working, I realize that the screen is not locked with these two keys, while if you enter the suspend/hibernation mode using the Applications Menu, screen is locked properly. This seems directly opposite than what Theiling reported. Theiling’s tweak is working, but I have one occasion that when you want to enter suspend/hibernation mode via Fn+F4/F12 you have to lock and unlock your screen first. This issue magically goes away when I tweak other things so I am not sure what makes it disappeared. I also tried the method of 00screensaver-lock posted on archlinux but it does not seems to be working. # Hack for xfce4-session v4.8 to support screen lock on sleeping. CMD="xfconf-query -c xfce4-power-manager -p $KEY || echo true"
if test "x$DOLOCK" = "xtrue"
Theiling also reports that the issue is fixed in Xfce 4.9. # that user in order to connect to the X server. Initially, maximazing the window with double clicks on the title bar seems buggy to me, as the window may or may not be maximazed. This is because the default interval threshold (250 ms) is too short for me. Navigate thru Applications Menu > Settings > Mouse > Behavior, and increase the “Double Click Time” should do the trick. For me 400 ms is enough. Be sure to install thinkfan and hdapsd for automate fan control and IBM Hard Drive Active Protection System. The Workrave applet in the notification area is corrupted with the original Workrave 1.9.909 in Xfce 4.8. I remove the original one and compile the most recent version from git (1.10.2 at the time of writing) and it works like a charm. The drag-n-drop feature seems buggy with Iceweasel 24.4.0. Xfce/Thunar mounting SD card: after clicking the “eject” icon in the sidebar, the icon is still there despite the device has been ejected. Fn+Home/End moves in multiple steps. The volume control keys can only control the Alsa mixer called ThinkPad Console Audio Control, this leads to confliction if you use an external keyboard that can control volume and another mixer (like PulseAudio). Things are working, but just inconvenient. Some old-fashion features like the modem, infrared port and 1394 port. Here is another research blog! My name is Quan-Zhi Ye, you can just call me “Yeh”. I have been a die-hard lover of astronomy since a kid, and I am proud to find myself keep following the dream over years. I am currently doing my PhD in astronomy with Prof. Peter Brown at the University of Western Ontario on meteor science, but I am also very interested in other topics in astrophysics, atmospheric and planetary sciences and have been involved in some side projects in these areas. I am also eager to do outreach, but it is mostly within China (my home country). Although English is not my first language, I guess it won’t stop me from start writing a research blog. Perhaps things will get improved over time. I plan to put together bits from my research or something I find useful/related to my research, and I hope they can be of use to someone at some time, who knows — let’s see how this play out.